The emergence of online retail has led to a competitive market with traditional retailers forced to up their game. As the online retailing emanates a feeling of convenience, the traditional retail shops should also make sure that they make the whole retailing experience a walk in the park for the customers. 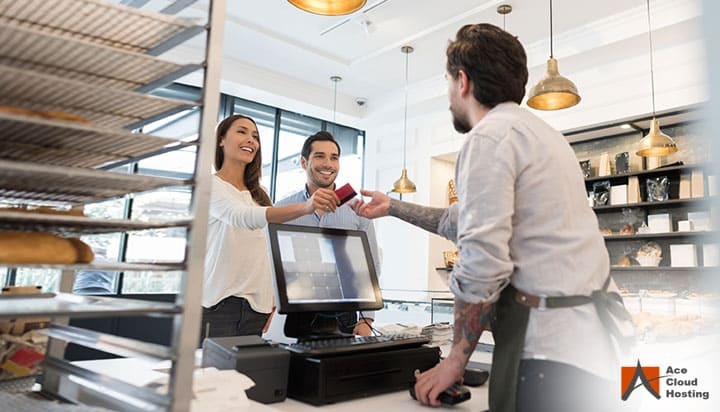 Along with helpful on-site staff, an enjoyable retail experience includes the customers being able to checkout without waiting in line for too long. If you are not able to deliver that, you are likely to lose your customers to the online competition. The POS systems have done just that as customers now have to spend less amount of time in line for checkout. Moreover, they can manage customer details to maintain loyalty points or at least to save the time of providing the same details of a returning customer. QuickBooks POS is one such software used by retailers all over the world. However, like any other software, working on QuickBooks POS on the local system has its limitations. These limitations can be overcome by hosting the software on the cloud referred to as QuickBooks POS Online. QuickBooks POS Online offers a level of flexibility and mobility to the POS system the local system cannot. Here are some of the aspects of QuickBooks POS Online beneficial for the customers. Assume that you are shopping at Walmart and there is a big line of customers ahead of you waiting to checkout. There have been many instances where people leave the store without purchasing anything. So, the question is what can be done to speed things up at the checkout kiosk? The first step is ensuring that your POS software is responding quickly. Increase the performance of QuickBooks POS software so that it can process the requests of customers more rapidly. Although QuickBooks POS is an efficient software, the machine on which it is installed is vital in determining its performance. When installed on the local system, the POS software works on limited resources such as RAM, storage and processor. In the peak time, when the shoppers are the highest, the load on the system increases and most likely the system might have heat up, its performance goes down. Customers are left waiting for hours at the register. QuickBooks POS Online enhances the performance of the software. As the software is hosted on the cloud, the resources can be scaled up or down as per the requirement. Hence, the retailer can have one specification for your QuickBooks POS for the holiday season and another for the regular days. The resources can also be scaled up automatically during the day so that the software always gives optimum performance. It ensures that you, as a customer, do not leave the store unsatisfied. When you go to a store specifically for an item, and the person behind the counter tells you that it is “out of stock” how do you feel? You would not want to revisit the store due to its incompetence. The retailers are not oblivious to the fact that no customer wants to leave empty-handed. However, for shop owners with shops at multiple locations, it is sometimes difficult to keep track of inventory. As the local POS system is restricted to the physical location, the owners must be in contact with the store managers of every shop to update the inventory. The cloud infrastructure empowers the shop owners to store the data of all the stores collectively. With QuickBooks POS Online, the inventory status of all the shops is saved automatically on the cloud. The owner can access the inventory of every store simultaneously and manage them better. Also, the owners can access the inventory status from anywhere round the clock. Data centralization and remote access make sure that the owners always keep track of the inventory, and you, the customer does not have to hear the words “Out of Stock” again. Whenever you go to any shop, you expect a seamless and enjoyable retail experience. For this to become a reality, the POS systems should be up and running all the time. If the local system on which the QuickBooks POS is installed crashes abruptly or freezes because of extra load on the system, you must wait for it to recover. The local IT team is summoned to resolve the issues that can take hours. Of course! There are multiple machines in the store, but a malfunction in any of the system can overload other systems as well. QuickBooks POS Online addresses this issue by offering retailers with the all-time availability of the software. Because cloud hosting is independent of hardware-constraints, it does not matter how much load is put on the software. The retailers can use the necessary hardware at the shops for the sole purpose of accessing the software. The QB POS hosting providers also back up the data so the system can be restored within minutes in case of a crisis. The retail stores ask for the personal information of the customers, so they can analyze their preferences and serve them better in the future. The personal information may be your contact details or home addresses. If that doesn’t look sensitive enough, remember that POS software can carry payment details. Suffice to say that the information should be protected from falling into the wrong hands. In a local setting, the retailers try their best to secure the data. However, it is not feasible to build as secure a system as the cloud infrastructure as it would cost significantly. QuickBooks POS Online providers ensure that your data is secure by deploying advanced security practices such as multi-factor authentication, Intrusion Protection and Detection Systems, end-to-end data encryption among others. With QuickBooks POS on the cloud, you can rest assured that your personal information is secure. To put it all together! QuickBooks POS Online is a cloud solution to all the POS requirements of the retailer. As the POS system is enhanced, the customers’ retail experience also becomes delightful. QuickBooks POS performs much better when hosted on the cloud which means no delay in order processing for the customers. QB POS Online also presents with a more secure infrastructure to store the customers’ personal information and offers high availability of the software. Good read! The way cloud hosted QuickBooks POS is explained is quite helpful. This solution is perfect match for multi-store retail stores. I agree with you that even though Quickbooks POS is a very helpful system in itself, the desktop version still has many limitations. I sometimes feel it is not that secure. After reading your article, I had a discussion with my team over how it will be beneficial to us if we switch to the online version of QuickBooks POS. One of the main reasons more and more people are turning towards e-commerce is because of huge checkout lines. Also, it is tough to check the inventory status of all the stores at a time given. However, as you mentioned using QuickBooks POS on cloud will allow me to check the inventory status while sitting at one place and to stay connected to other stores. I am inclined to give it a try.